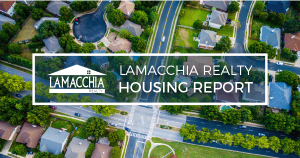 The Lamacchia Housing Report presents overall home sale statistics and highlights the average sale prices for single families, condominiums, and multi-family homes in Massachusetts and Southern New Hampshire for November 2017 compared to November 2016. It also looks at other metrics in Massachusetts like Homes Listed and Pending, as they are often the best indicators for predicting future trends in the market. 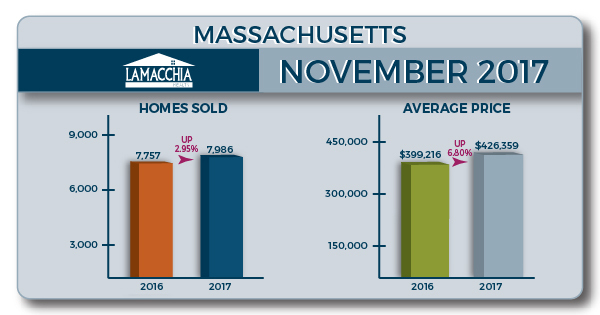 Massachusetts home sales increased almost 3% in November 2017 from November 2016, which at the time showed a significant increase of 26% from November 2015. Condos were the outlier, showing a decent positive change of 9.5% from 1,966 in 2016 to 2,152 in 2017. Single families increased 1.24%, from 5,061 to 5,124 this year, but multi-family sales decreased 2.94% in sales, from 730 to 710. The average sale price increased 6.8% overall in November, with increases in all three categories. Single families increased over 7.6%, from $434,916 in November 2016 to $468,208. Condos exhibited an increase of just under 7.5% (from $321,893 to $345,902), and multi-families increased in prices as well by 5.22% (from $432,880 to $455,479). In November of this year 6,399 homes were listed for sale in Massachusetts compared to 5,996 in 2016, showing a 6.72% increase. That’s almost half the number homes listed just last month which is to be expected, given the trends in diminishing inventory during the winter months. Click here to read a blog on inventory trends. There were 7,170 homes that went pending in November 2017 according to MLSPIN, compared to 6,971 in November 2016, which represents an increase of almost 3%. With both listed and pending sales number up in November, we could see a steady increase for home sales in the upcoming December 2017 housing report when compared to December 2016, but not when compared to sales this month. The number of properties sold in Southern New Hampshire rose 15.65%. Condos increased by the highest percentage, 24.71%, from 255 in November 2016 to 318 in November 2017. Single families rose 13.13%, from 731 to 827 and multi-family sales increased by 6.12%, with 49 sales in 2016 rising to 52 in November 2017. 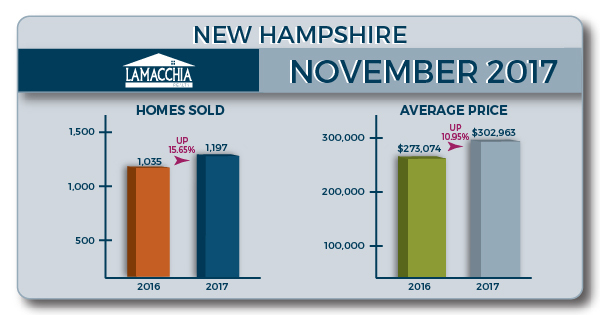 The average price in November 2017 for homes in New Hampshire increased by 10.95%, with multi-families increasing by over 23.5% in price, similar to October this year, from $299,498 to $70,089. Single families and condos exhibited more moderate increases, with singles rising 10.84% (from $284,731 to $315,600) and condos rising 8.8% (from $236,842 to $257,690). The year is ending very much like last year with a decent amount market activity but actually an even lower inventory of homes for sale. In fact, there are about 10% less homes on the market than there were a year ago when that was the lowest inventory since 2000. With this said it is clear that early January will be worse and by February buyers will be even more frustrated than this past year with all the bidding wars. It is best for buyers to get themselves. If you are a seller at this point it doesn’t really make sense to come off the market because homes do still sell in the end of December and the beginning of January, as explained in our holiday Mythbuster blog, and it’s worth a read if you’re considering listing now. The other good news for the market is that Tax Reform has passed and it didn’t really change very much for real estate as Anthony Lamacchia explained in this news segment on NBC the other night. Contact one of our expert Realtors to list and read our blog on the best ways to prepare for selling in the winter.